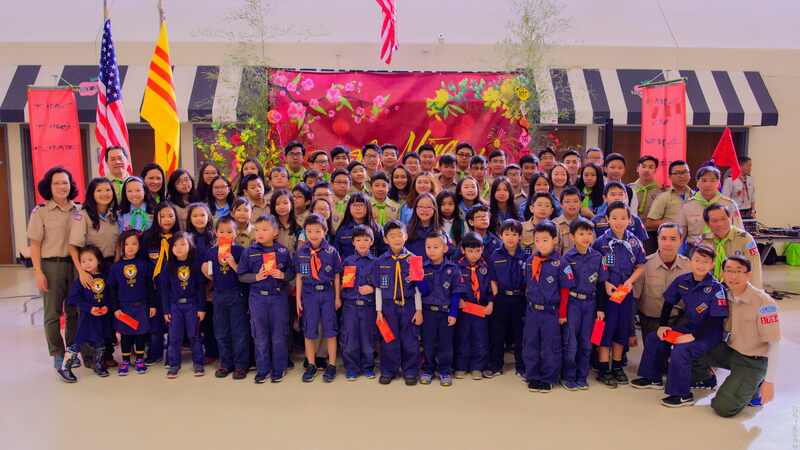 LD Tet Celebration or Hội Tết, is holds every year and holds a very special meaning for all the scouts, leaders, and parents. This event is the time where everybody can get together with their families to celebrate the new year with great food and fun activities. Not to mention the lì xì and fantastic performances. This year’s celebration saw the best performances yet! LD’s Troop 1794 performance was a talent show with three main parts. The first act was performed by the girls+Brandon, where they act out experiences with a vietnamese family which was very entertaining and hilarious for the audience. Another act was a suppose cooking segment performed by Evan and Minh Trung. The comical duo had one person(Evan) sit down on top of the other to be the speaker, as the person below would use his hands to handle the food and comedy. The last act saw Brain and Khang do an incredible dance performance which blew away the audience with their breathtaking dance moves and coordination. Scouts break to eat and to talk to one another. They met new people, new friends, and they laugh together. The food was excellent, it was a combination of homemade vietnamese food, pizza, and fried chicken brought by the parents. The abundance of food guaranteed scouts to be energize for the further activities. Multiple workshops entertain younger and older scouts alike, as scouts from other Liên Đoàns hangout to show dance moves or talk about the games. Troop 1794 ran the Đá Cầu game.